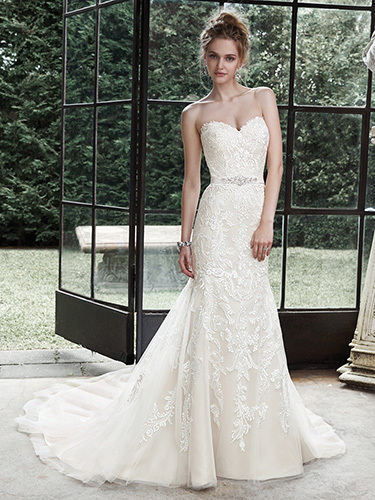 Dreamy lace and tulle combine to create this elegant fit and flare wedding dress; accented with timeless sweetheart neckline. A glittering Swarovski crystal motif on an optional grosgrain ribbon belt adds a touch of drama. Finished with covered buttons over zipper and inner elastic closure.This gown is also a Priority gown, which means it can ship out in as little as 8 weeks or less (no additional rush fee).